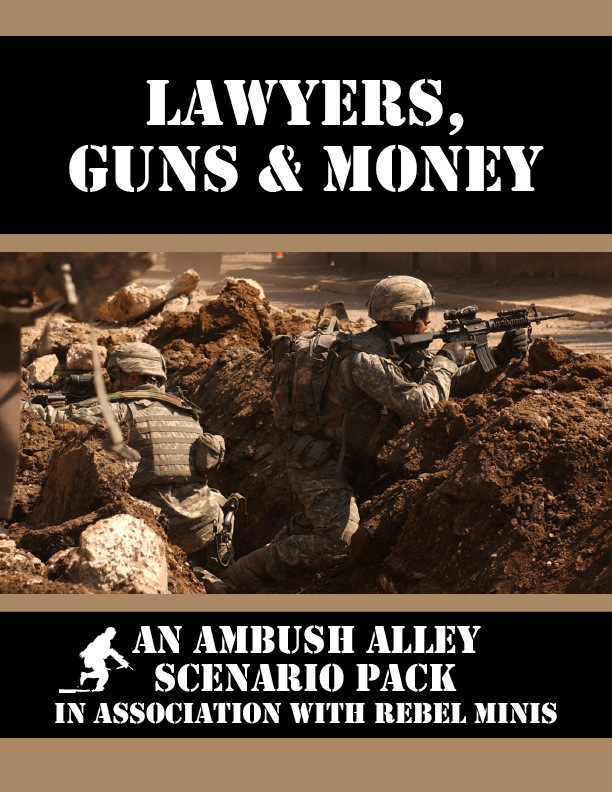 In conjunction with Ambush Alley Games, Rebel Minis is releasing another great scenario: Lawyers, Guns & Money! Designed to go with our 15mm miniature box set, these scenarios are perfect for modern miniature wargaming! The scenarios in Lawyers, Guns & Money focus on a VIP protection detail performed by the fictional Private Military Contractor (PMC), Aegis Group. This scenario set focuses on Private Contractors and 1 VIP, against a horde of Fedayeen/Insurgents. If you need the miniatures, you can check out our 15mm miniatures at www.rebelminis.com or use your own! There are three great scenarios in this PDF download! ***NOTE: YOU WILL NEED THE AMBUSH ALLEY CORE RULE BOOK TO PLAY THESE SCENARIOS! Cheung Kar Fai 8 8 8 3 interesting scenarios of an excellent rule system. Recommended.